ISLAMABAD, March 31: The Patron in-Chief of Supreme Shia Ulama Board and Head of Tehreek e Nifaz e Fiqah Jafariya Agha Syed Hamid Ali Shah Moosavi has said that Muslim states have lost the very reason of being part of the United Nations which is helpless for the resolutions of Palestine and Kashmir disputes yet bound to obey colonial and Zionist powers. The acceptance of Golan heights as legitimate part of Israel is big slap on the face of the UN which was founded for global peace. Muslim rulers must demonstrate courage and get united against Zionist and colonial agendas as otherwise, they will keep repenting. Had Arab rulers showed wisdom a century ago, the dagger of Israel would not have been stabbed in their chest. Submission to personal interests and the greed of power caused the decline of Islamic world. To create division among Muslims, America made them found Arab League and 39-States alliance and then they instigated wars in Syria and Yemen and later engaged middle eastern states in Qatar dispute. America is in search of excuses to start third world war which will cost the world with the lives of people of Asia and Europe. Every humanist must rise against the heinous designs of Zionist and colonial forces. America has imposed the law of jungle in the world. Besides international media, the silence of Muslims-Media is a big question mark? Continued aggression, terrorism and false allegations against Pakistan are aimed at weakening Pakistan and stop her from leading the Islamic world. Hazrat Imam Musa Kazim (A.S) spent all his life in prisons to protect the teachings of the holy Prophet Muhammad (PBUH&HP). The holy Imam kissed martyrdom however, did not submit to oppression and cruelty. The triumph of the Islamic Ummah lies in following the sacred character of Imam Musa Kazim (A.S). He said this while addressing to the Mehfil e Sadiq e Aal e Muhammad where he also announced to commemorate 23rd to 25th Rajab as Three-days mourning i.e. Alami Ayyam e Bab ul Hawaij in connection with the martyrdom anniversary of Imam Musa Kazim (A.S) while also demanded from the government to ensure fool-proof security for the Matami processions and Majalis e Aza all across the country. 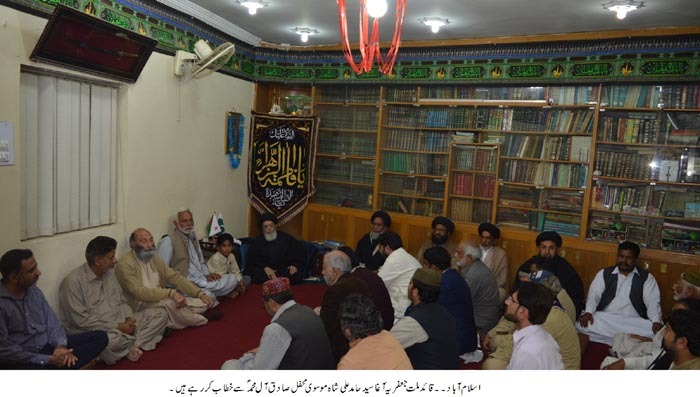 In his address, Quaid e Millat e Jafariya Agha Syed Hamid Ali Shah Moosavi noted that after the World War-I followed by the disintegrating the Otoman Caliphate, the culture and civilization of Muslims was also destroyed. Arabs were weakened to create the illegitimate state of Israel. British colonialism had orchestrated Israel’s creation while the chief of colonialism America took the responsibility of developing this illegitimate state and then both America and Britain worked on this project with religious spirit and dedication. He said that Trump’s enmity towards Muslims is already proven to the world as Israel has been the axis of American foreign policy while Trump has expedited actions on the project of greater Israel. After accepting Jerusalem as the capital of Israel, Golan heights have been accepted as legitimate part of Israel. Agha Syed Hamid Ali Shah Moosavi said that after defeating Arabs in the war of 1967, Israel had occupied the Golan Heights however, Arabs could not offer any retaliation. Israel burnt Baitul Muqaddas in 69 which shook the Muslim Ummah and they founded OIC whose second meeting was held in Lahore. The creation of OIC left the colonial powers worried and they got the pioneers of OIC Bhutto, King Faisal and Qaddafi killed through their own people. If Muslim rulers had realized about the conspiracies, and instead of falling each other, they had jointly confronted the troika of evil then they would not have seen such dismay. He said that like League of Nations, United Nations has died as if it was alive, concrete actions would have been taken against declaring Jerusalem as capital of Israel and accepting Golan heights as part of Israel. Recent American and Israeli actions are also a violation of Israel-Syria peace treaty in 1974. Agha Syed Hamid Ali Shah Moosavi reminded that if Muslim world gets united, the evil powers could be given a befitting response and for this matter, they must revive OIC, remove internal conflicts, and use organizations like 39-states against evil and colonial powers instead of confronting against each other.